Sandalinas is a new Spanish-Swedish band founded by Spanish guitar hero Jordi Sandalinas and singer Apollo known for his work with Time Requiem and Meduza. 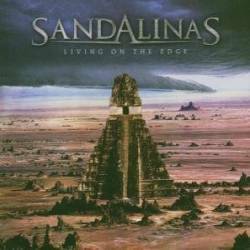 Produced by Andy Laroque (King Diamond) who plays guitar on two tracks, Sandalinas' debut album Living On The Edge is timeless melodic rock or metal in the line of bands like Pink Cream 69 and Gotthard. About half of the album is classic hard rock (Rainbow, Dokken). As this is well done for this kind of music, AOR fans really could get into this stuff. The two ballads on the album are annoying though; Follow Me is only a bit boring and powerless, but The Day The Earth Died surely is one of the worst and most deranged ballads I've ever heard. Fortunately there are also better songs like the very rhythmic Ritual Of Truth, the epic The Conqueror or the more commercial sounding pop rock song Die Hard, one of the first songs Sandalinas ever recorded. There are plenty rock anthems on this album to satisfy the average hard rock fan, but Sandalinas have a too classic approach towards music and don't dare any risks, making this an ideal album for music traditionalists.